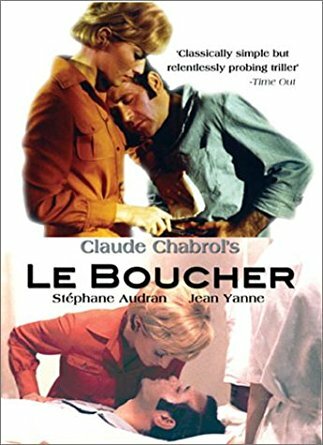 'Le Boucher' has real style, intelligence and emotional depth - typical of the work of the director Claude Chabrol. Chabrol, like his contemporaries Truffaut and Godard was a writer and critic before he began making films. As well as contributing to the influential Cahiers du Cinéma magazine he also co-authored a book on Hitchcock - who he greatly admired. He was a particular admirer of Hitchcock's 1943 picture 'Shadow Of A Doubt' and the influence of that film can be clearly seen in 'Le Boucher'. Unlike some of the New Wave Chabrol had a more classical filmmaking style - eschewing jump cuts and handheld camera in favour of deep focus and long takes. Stéphane Audran, who plays the central role of the schoolteacher was married to Chabrol for many years. Audran, who died in March of this year, had a long and glittering career which included 'Babette's Feast' in which she gave a memorable portrayal of a Parisian woman who sets out to prepare an extraordinary, elaborate meal for a remote Danish community. This quiet mystery features one virtuouso cinematic moment - a single shot lasting nearly four minutes in which the two leads walk through the town at night. 'Le Boucher' is probably Chabrol's most acclaimed film - an economical understated masterpiece - don't miss it. September 4, 2018 by Lucas Jones.